Happy New Year from the Mapview team! Our developers have been working hard on the exciting new features we plan to introduce in 2018. We won’t make you wait long, as our first new feature, data export, will be available as part of our next release on our about January 19. Before we look ahead, let’s reflect on 2017. Looking back on last year, our most popular feature release was spreadsheet import. With the ability to create custom record fields during the import process, it’s gotten rave reviews from our users. 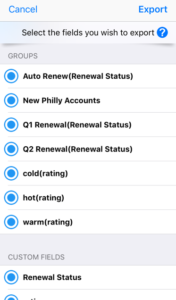 Now, anyone can note revenue bands, ratings, product info, and more, right in their contact records. 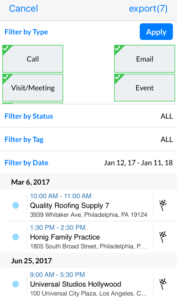 Having custom fields available at your fingertips as you travel to sales and service appointments means no more cramming all of this important info together into the notes field! Since data compilation and organization is important to our users, we are matchings spreadsheet import with activity export. With the upcoming release 7.8, users will be able to easily export their contact data, groups, and activities to a CSV file for reporting and data analysis. With our easy to customize export feature, you are in control of which contacts are included in your report. Not only can you select which contacts to export (all contacts, certain groups, specific views, or contacts based on search criteria), but you can also select the exact contact fields you wish to include in your report. Choose from the “basic” contact fields, any custom fields you’ve created, as well as fields to indicate group membership. Let’s face it, administrative reporting is one of our least favorite and most time consuming tasks. We hope to change that with this release! Now you can customize which activities you wish to export and quickly create an impressive report. Using Mapview’s filtering options, you can create and organize reports by activity type, activity status, custom tags, and date ranges. Check out our support guide with step by step instructions to guide you through your first export. We think you’ll find the process easy and intuitive to use. Our main goal of Mapview is to help sales and service reps save time while traveling. 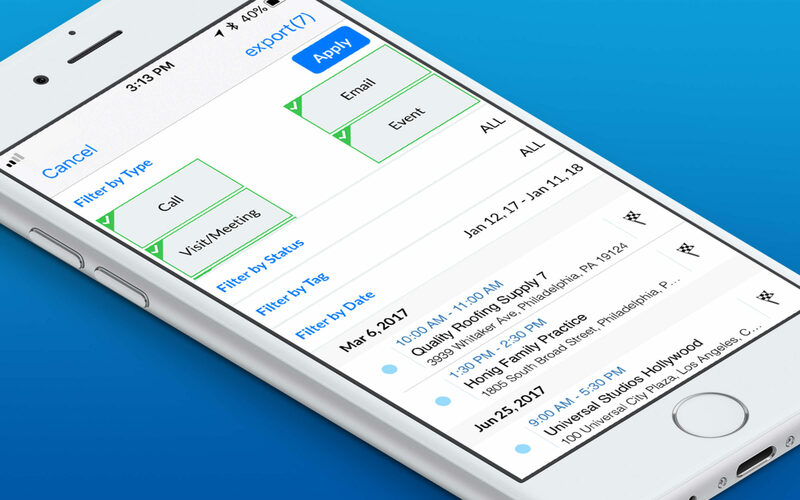 Now, we’d like to save you time reporting and analyzing your daily sales routes and service trips. We know many of you have reporting requirements due to your management, and we hope this feature will help you on those hectic Friday afternoons when you need to sum up your week!